While the online configuration page for the new 2014 Mercedes Benz CLA250 is fairly limited in its options right now, those who want to get their hands on the front wheel drive 4-door coupe in its most basic form are sure to be pleased with both the available options and the pricing as a whole. While we can most certainly expect to see an AMG variant of the CLA in the near future along with an all wheel drive 4Matic package for the CLA250 – the current build page offers access to price out the models that are likely to be the biggest movers here in the US. When you first go to the 2014 Mercedes Benz CLA250 build page, you are presented with a sedan (the company calls it a 4-door coupe but I am inclined to use the term sedan to describe the CLA) that carries a base MSRP of $29,900 plus a destination fee of $925 for a total price of $30,825 – a price which comfortably makes the CLA250 the least expensive option in the company lineup for American buyers. This price includes the buyer’s choice of three colors – Cirrus White, Night Black and Jupiter Red – for no additional charge. For $720 more, buyers can pick from five more colors that include Cosmos Black Metallic, Mountain Grey Metallic, Polar Silver Metallic, Universe Blue Metallic and Northern Lights Violet Metallic while Patagonia Red Metallic (shown above on the right) comes with an additional cost of $1,750 and the matte Magno Polar Silver Met hue costs a whopping $2,500…which is a big chunk of change for an optional paint choice on a car that costs under $30k. 17 inch 5-spoke alloy wheels are standard but for $500, buyers can opt for a sportier set of 18 inch wheels with a split spoke design. For $1,480, the CLA250 offers a panoramic roof option and $850 extra will get you a set of BiXenon headlights and LED taillights. Finally, CLA250 buyers who want a much sportier exterior appearance can opt for the $2,000 Sport Appearance package that adds a unique front fascia, rear fascia, side sills, 18 inch AMG wheels, a package specific chrome diamond block grille and drilled front brakes with paint calipers. 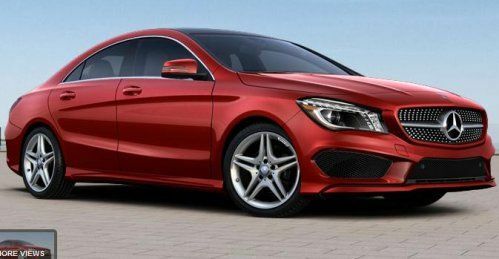 Were I to build my dream CLA250 from the currently available options, I would pick the Sport Appearance Package, the panoramic roof, the high end lighting package and the Patagonia Red Metallic paint – which bumps the “base” price up to $36,905. Next, you move to the interior options of the 2014 Mercedes Benz CLA250 where you pick your favorite interior color options. Those who want to avoid leather can select from three colors choices – Black, Beige and Ash – while opting for the $1,500 Interior Package can select leather finishes throughout the cabin in either Black, Ash or Brown. Anthracite or Aluminum interior trim can be chosen with no additional cost but those who want wood grain in Burl Walnut or Black Ash will pay an extra $325. Also, those who opt for the Interior Package also benefit from remote window controls in addition to the plush leather surfaces. Considering that this is a Mercedes, I would opt for the Black Leather with the Black Ash trim – options that raise the price of my dream CLA250 up to $40,930. You may notice that while my interior trim options should only add $325 and $1,500, the price jumps by $4,025. That is because adding the Interior Package also requires you to add the $2,200 Premium Package and the $580 heated front seats. The Premium Package adds dual zone climate controls, a Harman Kardon sound system, a high def media interface, auto dimming mirrors and a built in garage door opener while the optional multimedia package ($2,370) adds a rear view camera system, enhanced voice controls, an advanced infotainment system with a 80GB hard drive and a 7 inch touch screen, a six disc in-dash DVD/CD player and a 10GB music register. Adding all of these options brings the price of my CLA250 up to $43,300. Next, the 2014 CLA250 offers a Driver Assistance Package for $2,500, Active Parking Assist for $970 and Blind Spot Assist for $550 but since Im not too keen on “nanny systems”, I wouldn’t be adding any of those to my ideal CLA250. There is also a host of high tech features that work with your smart phone or tablet that can slowly increase the final price such as the mbrace package, mbrace plus and the Mercedes Benz Apps but since Im not into phone gadgetry – I wouldn’t be adding any of those either. However, for someone who really wants as many high tech goodies as possible packed into their new Mercedes Benz CLA250, checking every box in the current online configurator brings the final price to $44,914 while tacking on the cost of the super premium matte exterior paint brings the price up to $47,084. Click here to visit the MBUSA website and build your ideal 2014 Mercedes Benz CLA250.